Here’s a little known tip that both the young and old alike can enjoy when you are visiting Disney World. The next time you ride the monorail, ask one of the skycaps to let your party sit in the front. They may tell you that there is already someone else in line. That’s okay, tell them you’ll wait. The monorails run every couple of minutes and it’s worth the extra time. Only four people are allowed in the front. If you have more than that in your party, pick the four who want it the most and the rest of you can ride with the herd in the regular compartments and take a turn on a later monorail ride. 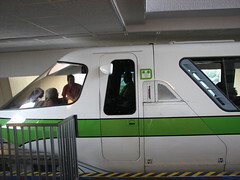 The front is where the monorail “pilot” sits to drive the monorail. (Yes, they are referred to as pilots.) In front of the pilot are bench seats that converge right to the front nosecone of the monorail. The windows give you a 180 degree view. Riding from the Ticket and Transportation Center to Magic Kingdom has the advantage of going straight through the Contemporary Hotel. Riding from the Ticket and Transportation Center to Epcot is a much longer ride and has the advantage of doing the circle through the middle of Future World in Epcot. If you time it exactly right, you can enjoy the fireworks display on your way to Magic Kingdom or Illuminations on your way to Epcot. The pilot might even give you a certificate or a pin. Maybe. Regardless of the time of day, it’s a fun treat for everyone to ride in the front of the monorail. Want more info on monorails? There’s plenty at the website of The Monorail Society! This entry was posted on January 23, 2009 at 2:00 pm and is filed under Tips. You can follow any responses to this entry through the RSS 2.0 feed. You can leave a response, or trackback from your own site.